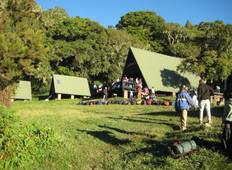 Discover a varied offer of budget hiking & trekking tours that will take you through some of the most renowned destinations such as Mandara Hut and Horombo Hut. Each affordable tour will provide you with memorable experiences for some of the lowest prices on the market. "Excellent service. Amazing price. Helpful and will help you make it to the top. Monkey..."
"We could not have been more pleased with our tour experience! Our guide, Charles,..."